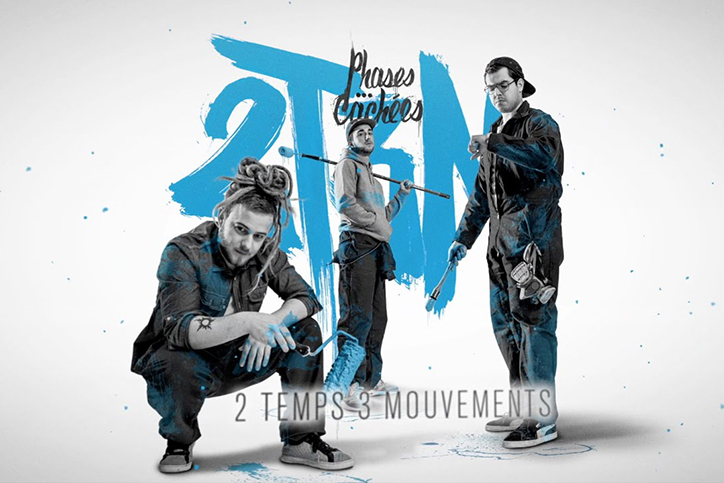 After they transformed the trial, the crew is back in front on the French Hip-hop scene with their second album, « 2 Temps 3 Mouvements » ! A second album is always a major stage in the history of a music band. It’s a step forward and a new challenge : you need to win over audiences and broaden your horizon. Stay true to yourself and keep progressing, look ahead and remember where you come from. Following this reflection, we made « 2 Temps 3 Mouvements », a couple of years after « Boules à Facettes ». In the same work environment, with Baco Records – Danakil’s independent label – by ours ide, we created this album more professionnally and peacefully, bands members now being full time musicians and rappers especially thanks to a 100 dates tour in France. After performing in front of thousands of people while supporting Danakil or Oxmo Puccino, we sold out venues in bars and halls from Rouen to Bordeaux and from Nantes to… Paris ! Then, the first distinctions came : Winner of « Paris Jeune Talent » and « buzz booster Ile de France » champion, selected by the RIF for the « Itinérances » disposal, And Cheeko became France champion of improvisation(End of the Weak)….2014 has been a crazy year in the band’s life . So now, we have to keep up the good work and set Phases Cachées in the spolight. And there is no secret for that : make an outstanding second album and perform on stage ! This is what we should do with « 2 Temps 3 Mouvements », our new opus : go where no one expects us, reinvent ourselves without forgetting who we were 3 years ago, create a surprise and shake everybody’s head (and mind). Hence our enthusiasm to hire a director, Blanka (la Fine Equipe/Jukebox Champions), offering a new, external perspective, his experience and confident style. DJ, Beatmaker and sound mixer : the ideal cast ! Now feeling safe and well accompanied, the musicians decided to start composing their own beats while leaving a good share to a lot of great beatmakers : S.O.A.P., S.E.B., Willy Wander the crew’s old mate , Fatbabs the « Deep Rocker from Rennes »currently working with « Naâman » – reggae newcomer of the moment and of course – Blanka ! On the promotion front too we tried to be innovative ! Because when it comes to promoting our new album, we get the job done. We produced a 24 titles mixtape, featuring no less than 23 guests, the upper crust of new French hip hop, reggae, soul and much more ! It’s called « Phases B volume 2 », and it is been available for free on our website since November 20. More than 10 000 people have already downloaded it. And we have more surprises to come for the album release. 2015 is gonna be our year! We have a great team, a new album on the way followed by a tour. One thing is for sure: we will definitely be there!